I have this visually dead corner on my front porch. Trying to find something either practical or pretty to fill it gives me fits. Storage space for new autumn decorations is practically nonexistent in our condo. 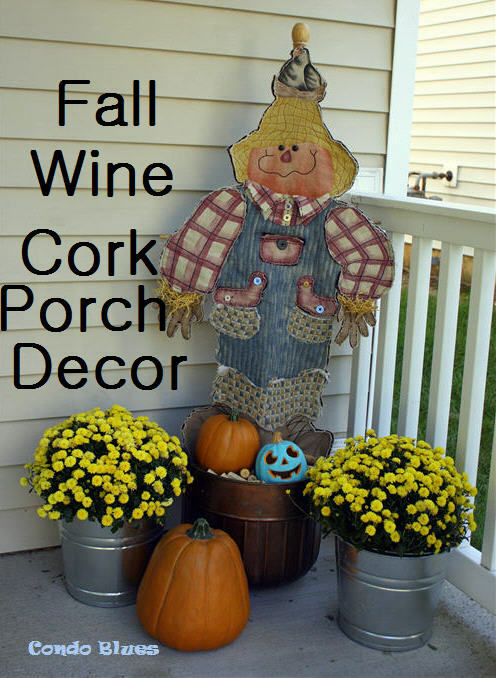 So I did a little summer and fall decoration shuffle from backyard fall patio decorations (take the fall patio decorating tour here on Condo Blues) to the front porch now that it is too chilly to eat dinner outside on the regular. Killing one of the mums I bought for the backyard actually worked in my favor. 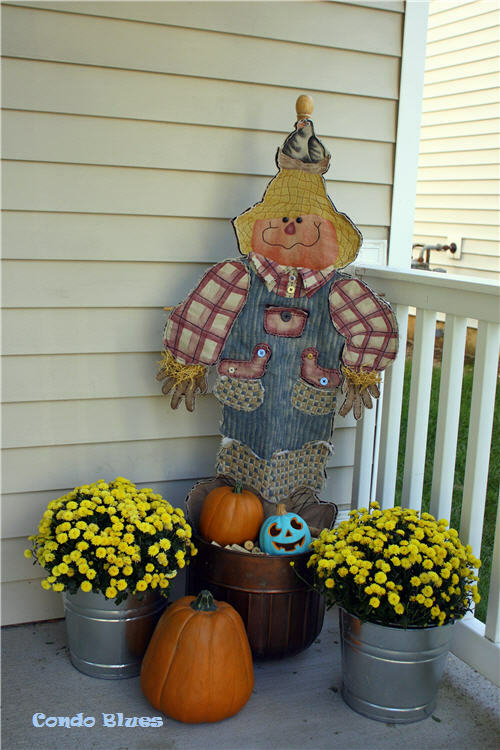 I used the pot of dirt in the metal planter to anchor the wood flagpole I used to hang the quilted scarecrow I made forever ago and haven’t found a good use for until now. 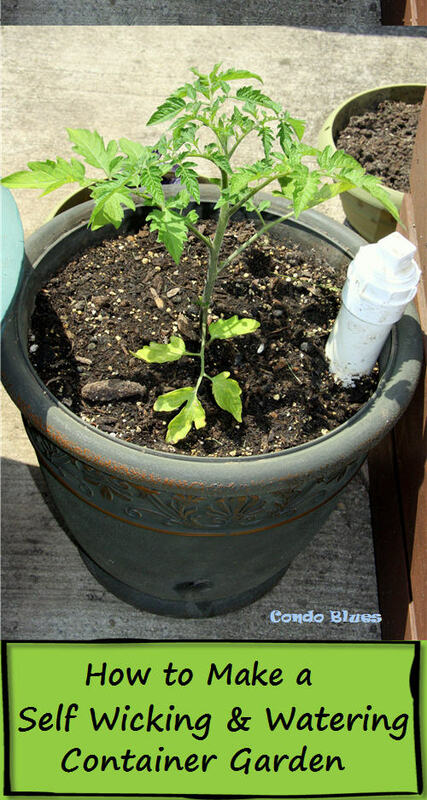 I traced the metal container and cut a circle to fit inside the metal planter with a hole in it for the scarecrow pole to keep it centered in the planter. The flower pot isn’t as deep as the metal planter so I chucked a couple of Husband’s empty protein powder containers in the pot to keep the cardboard from sinking into the planter so I can cover it with decorations and hide the cardboard lid. 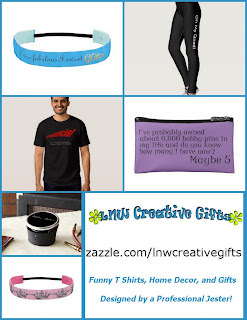 Keep reading for more decorating ideas and pin this post for later! Actually you can buy recycled wine corks on Amazon here if you need a bunch for craft projects. The living buckets of mums and a large fake pumpkin round out the scene. Yes, I realize real pumpkins are a greener decorating choice than fake pumpkins. I refuse to relive the childhood trauma of mean teenagers smashing our real porch pumpkins when we put so much work into them. I decorate with real pumpkins inside the house so I can bake and eat them later. 1. Make the sunshine yellow chairs look like fall and give me a blank color palette slate to decorate with for autumn and winter. 2. Protect the chairs from the elements because I don’t have a place to store them inside during the winter. 3. Remind me to keep looking for new porch furniture I actually like for next summer. 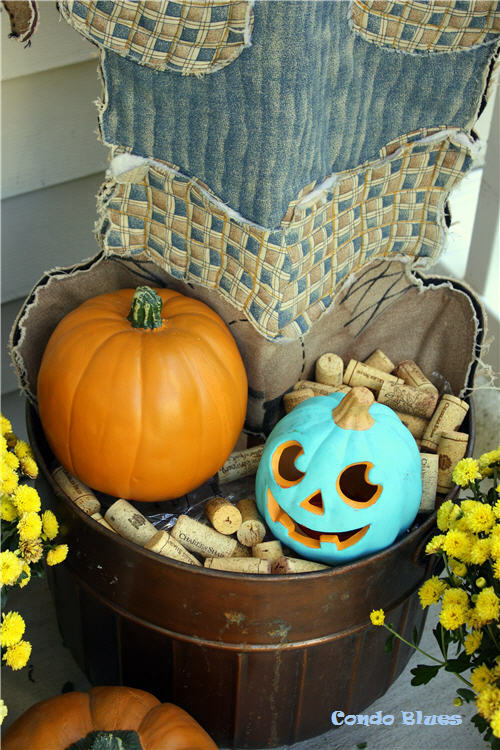 This summer I added orange and turquoise to the decorations on my front porch to coordinate with my wood round wreath. 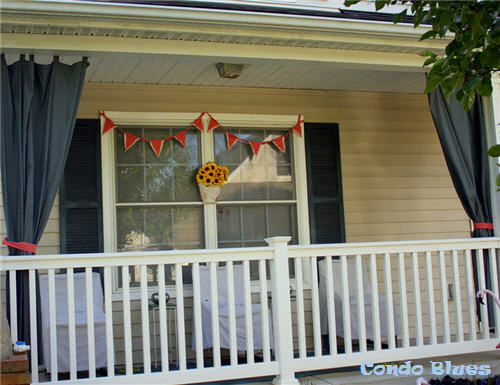 I hung the orange drop cloth pennant garland I made for autumn several years ago and haven’t used since. I like how it finishes the top of the windows and door and decided to decorate around it for fall. Pennant garlands make me happy! I see more pennant projects in my future. The new sunflower basket wreath (learn how to make my sunflower wreath on Condo Blues here) moved to the center of the windows because the strongly worded No Solicitors sign needs to be front and center on the front door for election season – sigh. Finally, I hung green curtains I had from an old apartment from café tension curtain rods like these and Designer Command hooks on the porch to frame everything out. 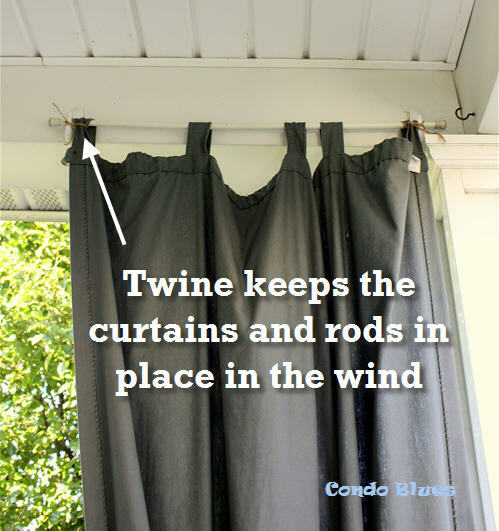 I am using tension rods instead of wood dowels because the rubber tips keep the curtain rods from blowing out of the Command Hooks during high winds and thunderstorms. I used Designer Command Hooks because I think they look nicer than the big standard utility Command Hooks. I tied the curtains open to tension rod and Command Hooks so the curtains fully cover the rod when the wind blows. 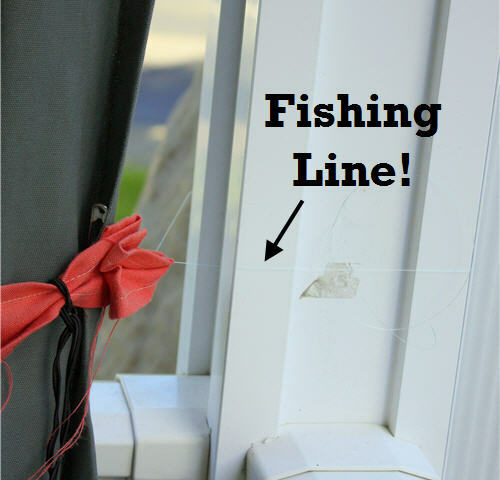 My secret to keeping porch curtains from blowing all over the place is to make outdoor curtain tie backs by pinning a strip of cloth around the curtain and using fishing line to tie it around the porch posts. Safety pins keep the cloth tie back from fall off the curtains and make it easy to change to coordinate with my outdoor seasonal décor. The best part of this is I can keep the decorations up for Halloween and all the way to Thanksgiving!